That statement might be a little much, but let’s set the record straight. Digital marketing is a TACTIC, not a strategy. Think about it. For most companies using digital is certainly an important arrow in your quiver, but there are much more important questions to ask before you determine digital is right tactic to use. Saying your focus is on digital marketing is no different than if you said you were focused on fax marketing many years ago. Remember any fax marketing agencies? 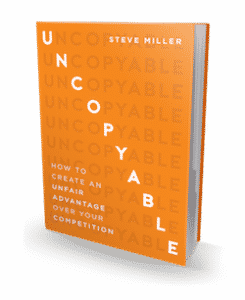 Watch this week’s UNCOPYABLE Business video and see what you should be focusing on before you decide what media channel will work best for your company! I’m creating a NEW Marketing Course! If you’d like information (updates, when it’ll be available, etc. ), just CLICK HERE. There is NO obligation. Steve, you hit it out of the park with this video! What a breath of fresh air on the subject of marketing! Very good point that too many don’t think about. Thanks!